Before every practice, the Huskers stretch. Get loose, get the muscles warmed up and try to keep your body from getting hurt during the practice ahead. The last bit requires the team be on the turf of the Hawks Training Center. When they’re done, everyone stands up and jogs to the practice fields. Eric Lee Jr. doesn’t just stand up. He does this hybrid backflip, somersault motion to arrive at his feet. It’s the type of thing that makes us ordinary folks feel bad about our physical conditioning. For Lee, it not only showcases the type of athlete he is at the cornerback position, it’s become something of a habit. Lee, the 6-foot redshirt sophomore, is very superstitious. He has a pre-game ritual – which he won’t share, yet, to avoid embarrassment – and he has parked in the exact same parking spot throughout the entirety of Nebraska’s fall camp. Right by the middle staircase outside the Huskers' facility, on the left side of the lot, in spot No. 3. He’s had a tremendous camp – impressing coaches and teammates left and right – and he’s doing everything in his power to keep that up. Williams doesn’t worry about Lee when the ball is snapped, he knows Lee will be in the right spot. Stanley Morgan Jr., the wide receiver on the other side of the ball who has drawn Lee as a defender frequently throughout camp, complimented Lee’s ability to disguise his coverage and keep the receiver off balance. [He’s] obviously not a senior or junior, but he carries himself like an older vet guy in every aspect. Lee’s had time to grow, too. As a freshman, he redshirted. The decision didn’t make sense to him at the time, but it does now. He said it gave him time to learn how to manage himself and balance school with football, without having to leave the state every other week. He received reps in practice and was able to adjust to the faster-paced college game, without having to go through trial by fire on Saturdays. By all accounts, he feels his redshirt season helped him, and has set him up for success on the field this season. 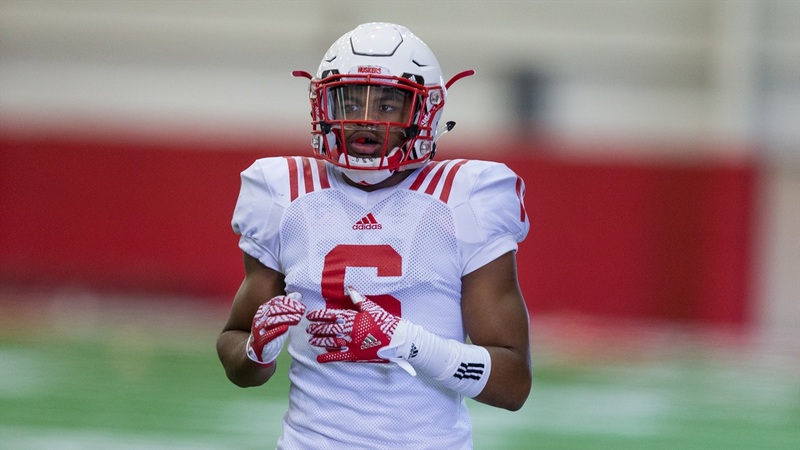 Last week, Williams called Lee one of the Huskers' three starting corners, along with sophomore Lamar Jackson and redshirt freshman Dicaprio Bootle. Even if senior corner Chris Jones hadn’t gone down with an injury before camp, Lee would likely still be seeing significant reps. Part of that stems from his eagerness to learn. “Every coaching tidbit that Chris [Jones] tells him on the sideline to help him out more, he’s not hard-headed, he’s taking everything he can to take that spot and fill that role,” Morgan said. Williams and Scott Booker, Nebraska’s safeties and special teams coach, both call Lee a “smooth” player. He doesn’t get rattled and he doesn’t beat himself. If you ask Lee's teammates – or his coaches for that matter – the word that comes up is “emotionless.” He doesn’t get too high and he doesn’t get too low. Everything is done in his head. If he blows a play up with a big hit or grabs an interception, he “might do something sly,” but you’ll have to really look hard to see it. And at the corner position, confidence isn’t a plus, it’s a prerequisite. Williams says if his corners aren’t confident in their abilities, they “shouldn’t be here and [they] shouldn’t be around me.” When a corner is in space, they’re on an island with all eyes on their every move. It’s easier to hide a mistake at the line of scrimmage where there are bodies everywhere; mistakes are amplified when it’s one-on-one in the secondary. That’s something Lee has always innately had, an edge to his game, a silent cockiness that’s allowed him to rise from redshirt to starter in a year’s time.